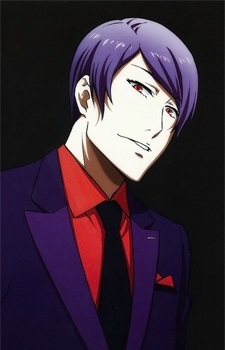 Shuu Tsukiyama is the infamous Gourmet ghoul. He is a fourth-year student studying Social Welfare at the Department of Human Sciences at Haruna Gakuin University. An eccentric man with opulent taste, his act as a gentleman and an intellectual, serves as a facade to hide a disturbed and narcissistic nature. As a ghoul, he displays his arrogance as a strong predator that seeks to devour the finest meals he makes of his 'prey,' so as to proclaim himself the top carnivore of the food chain. His interest in European literature and language is shown in his gestures and mannerisms, often peppering his dialog with borrowed English, French, and Italian. He shows great anger towards others who disrespect his taste in food; shattering a teacup in front of Kaneki during their date at the coffee shop when he remembered his encounter with Rize. Rize, while working at his Gourmet Club, believed that his picky eating habits made him seem more like a human than a ghoul, the worst sort of insult he could have received, and therefore Shuu bears grudges over Rize, calling her a 'pig' for ridiculing his taste for food. He was a member of the Ghoul Restaurant, known as "MM" until he betrayed them. Currently, he is obsessed with Ken Kaneki's flesh and blood. In Tokyo Ghoul:re, it is revealed Tsukiyama fell ill and became extremely thin after being led to believe Kaneki was killed by Arima. After finding out Kaneki is in fact living on as the Investigator Sasaki Haise, his health improved drastically and he was motivated to bring back Kaneki's memories. When confronting Sasaki, he comes to the realisation that he enjoyed the time he spent with Kaneki, and cares for him deeply, to the point that he no longer thinks of him as just food- he accepts that Kaneki is living a better life as Sasaki even though it breaks his heart that he cannot protect him like he used to. Tokyo Ghoul is filled with action, mystery and of course, a lot of ghouls! Despite the serious nature of the show, there are still a lot of "creative" memes from the internet about it. Below is a collection of 15 Tokyo Ghoul memes sure to make you smile, laugh and be hit with some powerful feels! Tokyo Ghoul is one of the most popular, and most unique, anime of all time. It takes place in a world home to humans and ghouls, as well as a few characters stuck in between. And with such a diverse cast, it's no wonder that Tokyo Ghoul cosplay have become so popular. Here are some of the best!